This week’s contributing blogger, Emmanuel Castillo, is a second year Masters of Fine Arts candidate at Pratt Institute, who experiments with hybrid mediums as part of his interdisciplinary practice. Currently, Emmanuel is investigating the role of materials in reimagining identity. The second talk of the 2018 Creating a Living Legacy (CALL)/VoCA Talks season covered preservation of artwork and legacy. 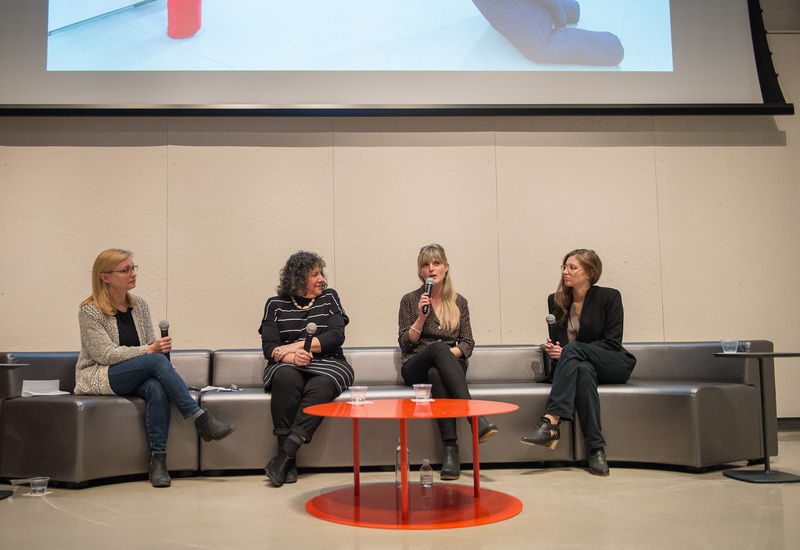 The talk, which was moderated by Kendra Roth, became the first program to highlight the perspective of CALL’s legacy specialists. Moreover, each of the three panelists – Antonia Perez, Rose Nesler, and Julia Rooney – represents a stepping stone in the chronology of CALL’s evolution. Materials carry their own legacy, and as such artists who experiment with materials must negotiate the conservation and preservation of their work. The three panelists discussed their practice with specific emphasis on materiality and the role documentation has to play in conserving their history. Antonia Perez, the first speaker, creates sculptures and public art with “single-use” plastic, such as plastic bags and bottles that are typically discarded after their contents have been disposed. Perez considers herself a missionary highlighting the negative impact of plastic on our planet, and looks forward to the day she may not need to use plastic. She expressed that her personal legacy exists in the social message of her work. As part of her practice, Perez recontextualizes plastic. The work will deteriorate over time; similarly, the human history remaining in the form of plastic will also deteriorate. Rose Nestler, whose installation, Gymnasia, is currently on display at BRIC, followed Perez. Her interdisciplinary practice includes video, sculpture, and installation with fabric. Nestler shared her interest in the beginning of craftsmanship, a period without gender identification. Her most recent body of work, investigates the gender roles that items of clothing represent. Nesler also asserts that the space housing artwork contributes to its legacy. She stores her artwork mindfully, and rids of the work she feels would not benefit her legacy in the long run. The third and final speaker, Julia Rooney, a source driven artist, finds inspiration in her life and her immediate surroundings. Rooney combats the assumption that an object or material will last forever, and challenges the preciousness of materials. She values the fluidity in the history of materials. Rooney recycles materials from one piece to create another, which transitions the legacy of a particular work into the other. 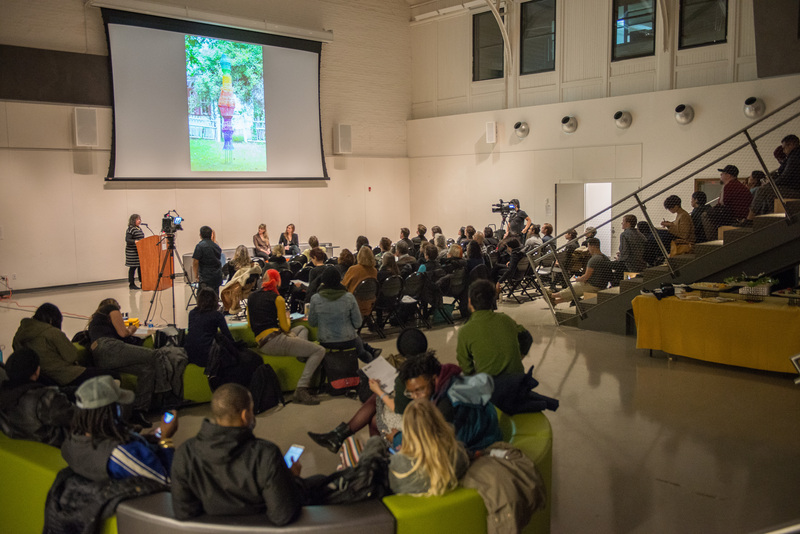 The artist individual presentations were followed by a conversation with Roth, during which the panel agreed that materials carry unique function, which shapes an artists work. However, particularly when a material chooses us, like plastic chose Perez, we must also embrace the specificity and serendipity those materials carry. The panelists also agreed that maintaining a legacy also means self care: rest is as valuable as the time we invest in our work. To the panelists, downtime comes in different forms. Maintaining a healthy work routine while resting from working on a particular project looks like reading, working on a completely different project, taking a break from the studio or engaging with other break time activities that improve mental health. Moreover, the panel discussed the role of websites and social media. Nesler shared that not all work needs to be visible to the general audience. Websites also serve as a crucial tool for documenting and archiving artwork. To Perez, social media is a tool to spark curiosity. In conclusion, the panelists discussed the role of mentorship. Mentorship allows for a practice, a specific way of making, to live on. An artist’s legacy exists in their artwork, but also in the members of their community who took part in the formation of their artistic fingerprint.